Pillage the Kobold magot! In the midst of piles of rubbish and mountains of disparate objects that she has stolen, the Kobold tribe relentlessly pursues its unrestrained exchanges. Lost in the middle of this sea of ​​junk is the Mabinogi Branch, a relic that can restore life to a dying soul. However, defeating this bloodthirsty horde will only be the first step; a group of Elves Depths stands ready to chase anyone who would regain possession of the branch. Unearth the treasure buried in the trash and defeat your enemies to seize the power of life! 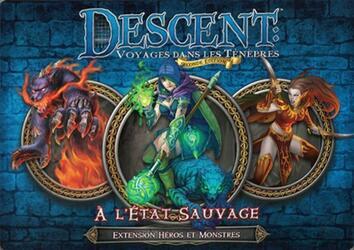 Add new legendary heroes, as well as monster abjects, to your Descent games: Dark Journey Second Edition with the Heroes and Monsters Wild State Expansion. Discover the unique characteristics of these monsters and heroes by living the quests included in this expansion, individually or through Rumor Cards. The Heroes and Wilds Monsters Expansion contains 4 heroes, 3 monster groups and 2 new quests, adding new options to your Descent games: Dark Travels!